Now I've finished all of the really long seams on the shirt: the sleeve and side seams. 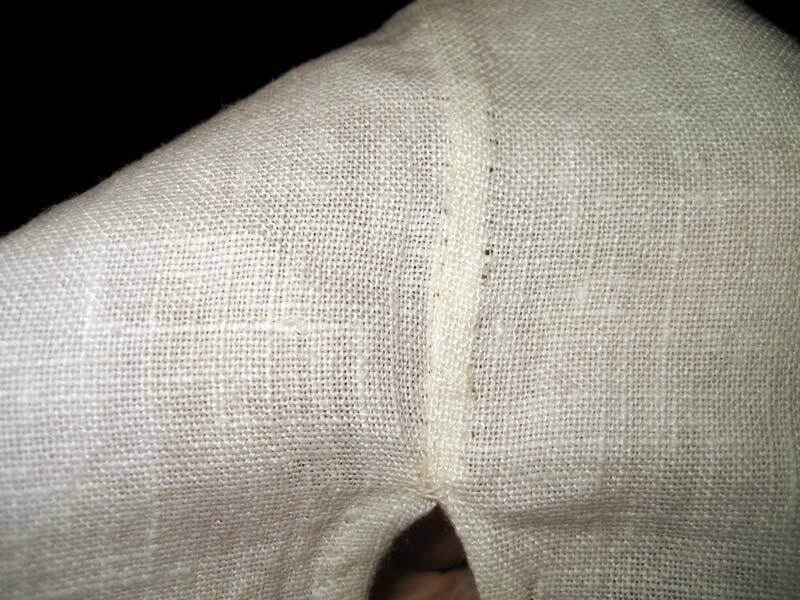 Both of these seams are flat felled, which means I have to sew them twice - once for the main seam and then again to contain the fabric edges. The shirt basically looks finished now, so I won't take any full-on pictures until I've actually finished the final steps. I did try it on to make sure the collar fits around my neck. A little late in the game to check that, don't you think? 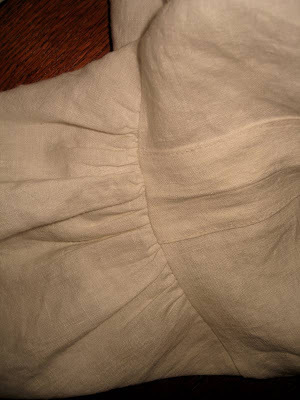 Below are two shots of the underarm gusset: once before finishing the side seam, and once after. Surprisingly (well, it shouldn't be, since these really are all rectangles and squares, so the math shouldn't be hard to figure out) everything fit without having to really work at easing the seams together. 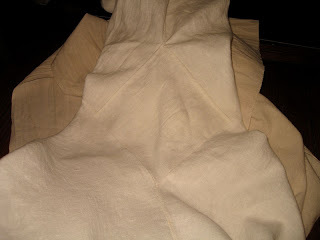 Here's the sleeve head, with the massive amount of fabric pleated up just like with the collar and cuffs. With the sleeves, only the top portion is pleated, leaving the sides and underarms flat so they're more comfortable (and easier to fit into the fitted sleeves of your jacket). Finally, a close-up of the side seam. This is at the very bottom of the shirt, where the front and back split for a few inches. 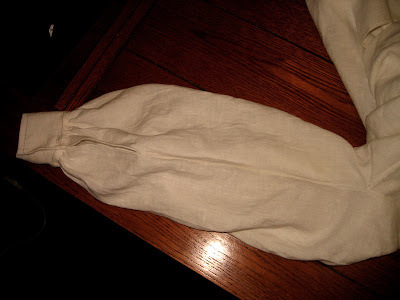 Eventually there will be another gusset sewn here for strength. This is a good view of the flat felled seam. 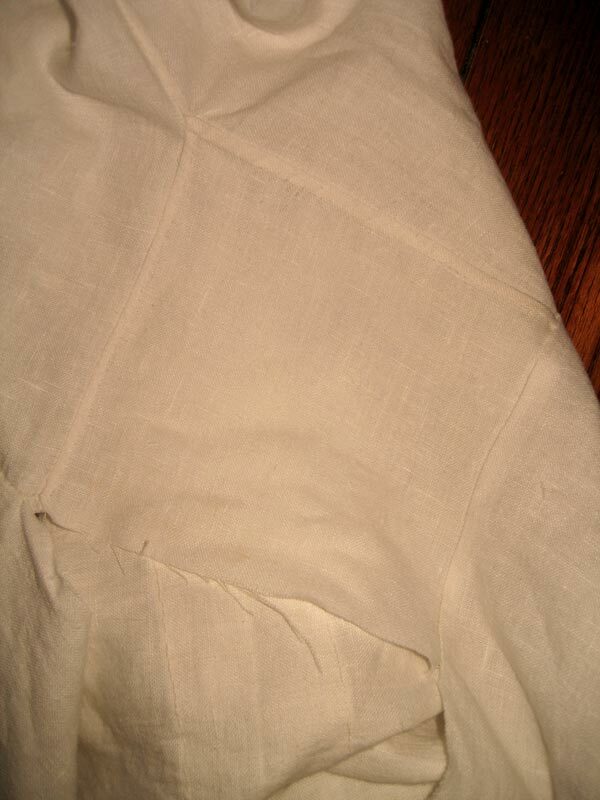 Also, this is about the right colour of the linen. I haven't white balanced my camera, so in the pictures here it ranges from cream to white. It's really white.